Kiln Building Refractory Bricks and Insulating Firebrick for Furnace Building and Repair. Soft bricks and hard bricks are made of refractory fire clay, ground-up pre-fired clay aka grog, and alumina . Refractory fire bricks are fired to a very a high temperature in massive industrial furnaces. The soft bricks are very light and porous and are designed to insulate. 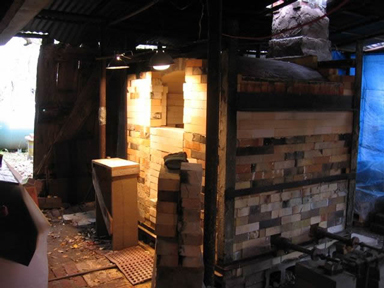 These kiln fire bricks are used in electric and gas fired kilns and as an outer insulation in wood and salt kilns. The dense / hard bricks are very heavy and are designed as structural bricks and are employed in kilns and furnaces that have caustic or abrasive environments such as in wood burning kilns, salt kilns and coal fired furnaces. Kiln building refractory fire bricks, blocks, and tiles are stacked to form insulating furnaces, boilers or other thermal process vessel walls. The refractory fire bricks are usually cemented together with refractory mortar. Shown top is a new gas kiln made with G series soft refractory fire bricks from Sheffield Pottery by John Zetner of New Hampshire Potters Guild. Note: Soft bricks can be cut with a regular carpenter's hand saw to create custom shapes. CHOOSE HARD BRICKS FOR OUTDOOR APPLICATIONS : Used for wood burning kilns. Soda kilns generally require 70% alumina hard fire bricks. 70% ALUMINA -A chemical and ceramic bonded 70% alumina brick designed for the following applications: Electric furnace roofs, ladle bottoms, side walls and slag lines, rotary kilns, cement kilns, torpedo ladles, tundishes, and hot zones of lime kilns.